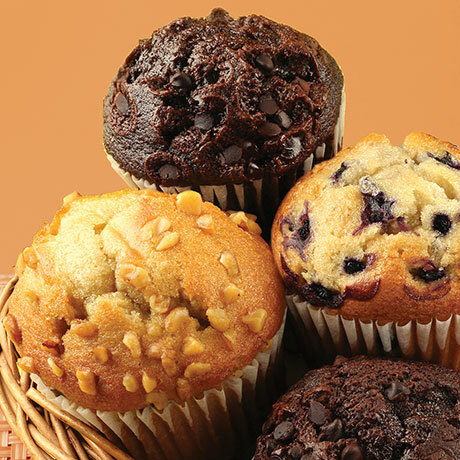 Indulge in wild blueberry, banana nut, and chocolate chip muffins. Grab one on the go for breakfast or a snack during the day! 9 assorted individually wrapped 4 ounce muffins. WILD BLUEBERRY: CONTAINS EGGS, SOY AND WHEAT. SUGAR, ENRICHED BLEACHED FLOUR (BLEACHED FLOUR, MALTED BARELY FLOUR, NIACIN, REDUCED IRON, THIAMINE MONONITRATE, RIBOFLAVIN, FOLIC ACID), BLUEBERRIES, SOYBEAN OIL, EGGS, WATER. CONTAINS 2% OR LESS OF THE FOLLOWING: FOOD STARCH- MODIFIED, SOY FLOUR, WHEAT PROTEIN ISOLATE, LEAVENING (SODIUM ALUMINUM PHOSPHATE), SALT, PROPYLENE GLYCOL MONOSTEARATE, MONO- AND DIGLYCERIDES, SODIUM STEAROYL LACTYKATE, POTASSIUM SORBATE AS A PRESERVATIVE, NATURAL AND ARTIFICIAL FLAVORS, XANTHAN GUM, CALCIUM SULFATE, LECITHIN. ENRICHED FLOUR (FLOUR, MALTED BARELY FLOUR, NIACIN, REDUCED IRON, THIAMINE MONONITRATE, RIBOFLAVIN, FOLIC ACID), SUGAR, SOYBEAN OIL, BANANA PUREE, EGGS, WALNUTS, WATER, CONTAINS 2% OR LESS OF THE FOLLOWING: FOOD STARCH- MODIFIED, LEAVENING (SODIUM ALUMINUM PHOSPHATE, BAKING SODA, MONOCALCIUM PHOSPHATE), SALT, NATURAL AND ARTIFICIAL FLAVORS, WHEAT PROTEIN ISOLATE, POTASSIUM SORBATE AS A PRESERVATIVE, XANTHAN GUM, CARAMEL COLOR, CALCIUM SULFATE, LECITHIN. SUGAR, ENRICHED FLOUR (FLOUR, MALTED BARELY FLOUR, NIACIN, REDUCED IRON, THIAMINE MONONITRATE, RIBOFLAVIN, FOLIC ACID), SOYBEAN OIL, EGGS, WATER, CHOCOLATE CHIPS (SUGAR, UNSWEETENED CHOCOLATE, COCOA BUTTER, DEXTROSE, SOY LECITHIN, VANILLA), COCOA PROCESSED WITH ALKALI, CONTAINS LESS THAN 2% OR LESS OF THE FOLLOWING: FOOD STARCH- MODIFIED SOY FLOUR, PALM KERNEL AND PALM OIL, LEAVENING (SODIUM PHOSPHATE), CARAMEL COLOR, SALT, WHEAT PROTEIN ISOLATE, POTASSIUM SORBATE AS A PRESERVATIVE, PROPYLENE GLYCOL MONOSTEARATE, MONO- AND DIGLYCERIDES, NATURAL AND ARTIFICIAL FLAVORS, XANTHAN GUM, CALCIUM SULFATE LECITHIN.